This space wallpaper from the NASA/ESA Hubble Space Telescope shows the galaxy cluster MCS J0416.1–2403. This space wallpaper from the NASA/ESA Hubble Space Telescope shows the galaxy cluster MCS J0416.1–2403. This is one of six being studied by the Hubble Frontier Fields programme. 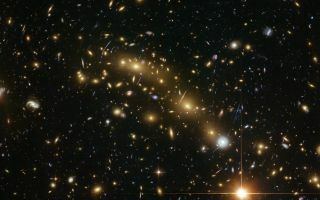 This programme seeks to analyse the mass distribution in these huge clusters and to use the gravitational lensing effect of these clusters, to peer even deeper into the distant Universe.